Garage door cables can be a very dangerous part of the door to replace or repair without the proper training and tools. The cables are typically under incredible amounts of tension, and therefore, must be handled with care by a trained professional. For safety reasons, we highly recommend that when faced with a broken garage door cable, please contact ProTec, your local professional garage door repair technicians. Our highly trained and skilled technicians will safely examine and assess the issue, then take the necessary steps to have your door working again. We will do it as efficiently and effectively as possible. The next time you are faced with a broken garage door cable, trust your repairs to the industry leader, ProTec. Cables are a significant component of a garage door. High quality cables will ensure a high performing garage door. In a torsion garage door spring, cables are attached to the drum above the door and to the brackets at the bottom of each side of the door. Meanwhile, in an extension system, the cables are part of the pulley system. Garage door cables ensure smooth and safe functioning of a garage door by holding the weight of the door. 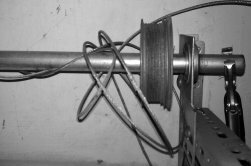 The cables; however, are subjected to wear and tear over time and can bend or break at any point. Not only will your garage door not open and close properly with a faulty cable, but it will also put your life in a precarious situation. Quite simply, without intact cables your garage door will break or fall. If you have a frayed or broken garage cable, it is time you consulted with an expert to fix the grave issue. Do not try to fix the cable on your own. It is too risky to deal with the wires yourself. In addition, garage door cable repair requires certain technical expertise that only professional garage door repair companies possess. Don’t put your safety at risk. And don’t waste your time any further. Just call the professional experts at ProTec to repair your broken garage door cables. We are your one-stop solution for everything related to garage door installation and repair services in Charlotte, Hickory, Mooresville, Greensboro, and Winston Salem . Apart from garage door, spring, and roller replacement along with tune-up and maintenance services, we specialize in fixing malfunctioning garage door cables. We have fully trained specialists to take care of your broken garage door cables. Our technical experts are the best in the business. Apart from knowing the garage door repair business inside out, our technicians also value your money and time. They will reach your home within hours of calling. In addition, their trucks are stocked with quality cables for any brand, so they will replace your broken cable on the spot. We will conduct a thorough 25-point inspection on both your garage door and its opener to ensure its safety. During the safety inspection, our skilled technicians will assess what factors led to the breakage of the cable. Furthermore, they will inform you of any additional damage, if it has occurred. In addition to cable repair, our technicians will also provide tune-up services for all parts of the garage door, as well as the garage door opener. This includes lubrication of all movable parts, adjustment of the spring tension, tightening of hinges, and more, to ensure your garage door works smoothly and safely. We will guide you on the best cables for replacement purposes. Our technicians will replace your broken cables with premium parts, designed specifically for your specific model of garage door, and that meets the required safety standards. We provide cables that last nearly three times longer than our competitors’ cables. While our competitors use seven strands of seven wires, we use seven strands of 19 wires! Remember, the more wires used, the stronger the garage door cable will be. Besides lasting for years, our heavy-duty drums lift larger doors and accommodate thicker cables. ProTec provides the most comprehensive garage door cable repair service at the most economical cost. We guarantee that our top-notch cables and repair service will leave you wanting to do business with us again. You can count on our exceptional garage door repair solutions for years. Whether you are in need of a brand new cable or just require us to fix your current one, we can do it all. We offer free estimates on garage door cable repair, in addition, we also provide the best warranty on our parts and services. We strive to provide our customers with garage door services that suit their specific requirements. Our mission is to not just meet your expectations, but exceed them. We offer a professional, reliable, and efficient garage door cable repair service 24 hours a day, 7 days a week. We also offer same-day service to address your broken garage door cable issues immediately. In addition, your questions are always welcome. Whether you need information on new garage door cables or tops on how to maintain your current cables, we will always be available to answer all your queries, without charging any amount. We want to ensure that our customers are well informed and understand the entire process of repairing the garage door cables. Call us at (844) 206-DOOR, if you find that your garage door is broken or unbalanced due to faulty cables. We promise to make it work as if it is new again!